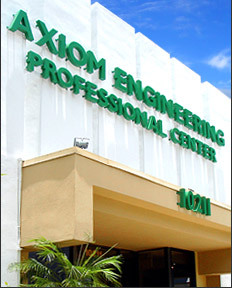 Axiom Engineering, Inc. is a full service structural engineering company. We are located in Coral Springs, Florida. Our primary service area is Southeast Florida from Fort Pierce to the Florida Keys. We are licensed to work throughout the State of Florida and at the client's request will work outside of our primary service area. Axiom Engineering, Inc. was founded in 1999 to provide high quality engineering services, outstanding customer service, and reasonable turnaround times. Customer service is something that many talk about but few deliver, and Axiom Engineering assures you that your experience with our company will be unequaled in the service that you receive. Call our office during normal business hours and you get a live person that is skilled to assist you - no automated phone attendant or getting lost in a computer controlled phone system. At Axiom Engineering we understand that our job begins with understanding your needs so that we can develop an accurate and efficient engineering solution for your project. Axiom Engineering's communication with its clients is unparalleled and most importantly when we make a commitment, we deliver. Whether you need to design drawings for permitting, repair plans, project management or failure analysis, make Axiom Engineering your choice for quality, service and timeliness. We are serious when it comes to customer satisfaction and assure you that you have made the right choice with Axiom Engineering.